In this post I'm focusing on Oracle Database SQL elapsed time, adding parallelism into the mix and then revisiting wall time. What initially seems simple can take some very interesting twists! If you are into tuning Oracle Database systems, you care about time. And if you care about time, then you need to understand the most important time parameters: what they are, their differences, how they relate to each other and how to use them in your performance tuning work. A couple weeks ago I wrote about Oracle DB Time, non-idle wait time, and server process CPU consumption (DB CPU) time. If you have not read that posting, HERE is the link. 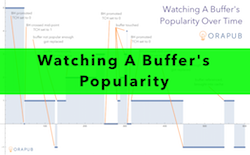 It must be a good read because it quickly become my most viewed post ever! In this posting, the focus is SQL elapsed time, parallelism, and again wall time. Enjoy! In my previous related post, I covered non-idle wait time, DB CPU, and DB Time. Here is a very quick summary of each. Non-Idle Wait Time occurs when an Oracle process is not consuming CPU, the session pauses (i.e., waits) and Oracle considers the wait time important for performance tuning. An example of a non-idle wait event is direct path read temp. An example of an idle wait event is SQL*Net message from client or pmon timer. DB CPU is Oracle server/foreground/shadow process CPU consumption. This is not include Oracle background process CPU consumption. DB Time is DB CPU plus Non-Idle Wait Time. Remember that DB Time does not include background process CPU consumption and Oracle Corporation determines which wait events are considered idle. It is common for there to be some extra time in DB Time as well, but I'll save that for another post! Elapsed Time (ET) is all DB Time related to a defined task. A "defined task" could be a SQL statement, group of SQL statements, pl/sql procedure, batch job, etc. It is whatever makes sense in your tuning situation. The elapsed time for a SQL_ID can be found in v$sql. But be careful because this elapsed time is related to "all" the SQL_ID executions. Thankfully, there is an "executions" column in v$sql. Elapsed time is displayed in a number of areas within an Oracle Database AWR and Statspack report. Looking at the above screen shot, the "top" elapsed time SQL has an elapsed time of 268561 seconds. This means that over the AWR report's snapshot interval, for all this SQL's executions, its total DB Time is 268561 seconds. Said another way, if we were to add up all this SQL's DB CPU and non-idle wait time for all its executions within the snapshot interval, the value should be 268561. 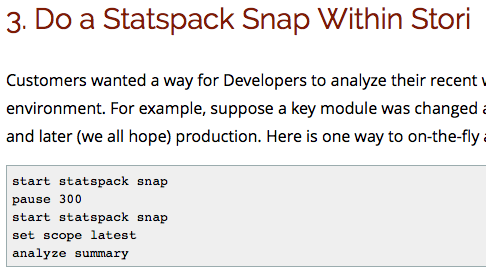 There is a lot of great information provided in the AWR and Statspack SQL reports. For example, because the elapsed time and the CPU time (DB CPU) is shown above, we can calculate the non-idle wait time for the "top" elapsed time SQL ID. 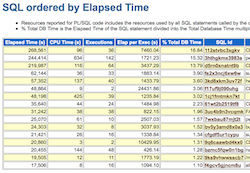 For the "top" elapsed SQL, its elapsed time 268561 and it's DB CPU is 96 therefore its non-idle wait time is 268465. Wow! This statement has tons of associated wait time compared to CPU consumption time. But it gets even better! Because the total Elapsed Time and the total number Executions over the snapshot interval is displayed, we can determine the average elapsed time! Do not be deceived! The average elapsed time is unlikely what the user is experiencing. Two possibility examples for this deception are skewed elapsed times and parallelism. For most DBAs this is unexpected. It also causes performance perception problems yet solutions are available to understand what's really going on. I've spent so much time researching this topic and seen it increase my consulting value, I've posted a number of blog entries on this subject. Plus I created an OraPub Online Institute seminar focused specifically on this subject. It's called Using Skewed Performance Data To Your Advantage. Check it out. I'm really proud how it turned out. I also have a couple of OSM scripts dedicated to this topic, sqlelget.sql. Now it's time to put this all together. DB CPU is the Oracle server process CPU consumption. Non-Idle Wait Time (NIWT) is the time when an Oracle process can not consume CPU and must pause and we care about this time. DB Time is the Oracle server process CPU consumption and all non-idle wait time. Elapsed Time (ET) is the sum (i.e., all) DB Time related to a task, such as a SQL_ID. Wall Time is what we hope the user experiences. I'll assume there is no time gap between Oracle and the user, therefore the wall time will equal the user's experience. Parallelism can reduce wall time because we can simultaneously "burn time" in multiple places. For example, 60 seconds of elapsed time with a process running serially, results in a wall time of 60 seconds. But if we have two parallel query slaves, while the elapsed time (i.e., all the DB Time) is still 60 seconds (plus some overhead time), the wall time will be around 30 seconds (plus some overhead time). The math is really simple...that is until you factor in scalability (i.e., the overhead), which I won't. If you're interested, read the last chapter of my book, Forecasting Oracle Performance. Let's simplify this by using some mathematical notation. Pretty straightforward, eh? Below is a short video clip summarizing this using a scene from the OraPub Online Institute seminar, Tuning Oracle Using an AWR Report (based on an Oracle Time Based Analysis). True or False? Bonus question yet very important to understand: If the elapsed time per execution is 60 seconds and two PQ slaves are involved, then the wall time will be 30 seconds. The last question is false because there is overhead when parallelizing. Parallelism is not free. Because of this, the wall time will hopefully drop to perhaps 35 seconds. That 5 seconds is the parallelization overhead. Coming Up Next: Video Proof! While the above may seem correct, I ran some SQL statements and captured the relevant time statistics. There is quite a bit of detail and I ran two different tests, so I'll post that in a week or two.